Chapter Wall of Honor - A Legacy to Pass On! This area is dedicated to preserving the chapter's legacy of leadership, volunteer service, and personal fortitude that is required to reach the level of professionalism & achievement for the distinctions below. 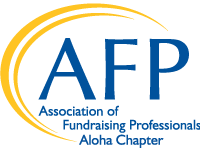 While AFP International and the chapter in Hawaii provide an annual framework to strive for, these honors are a reflection of the collaborative work of our members, the generosity of the organizations in which they are employed, and ongoing relationships with our trusted colleagues and partner organizations. We share this digital wall in their honor and with deep appreciation to inspire the next generation to add their own significant additions and maintain the foundation that has been created to support our mission. The Chapter Ten Star & Ten Star Gold award honors those chapters who have accomplished many of the key objectives outlined in the Strategic Plan. Both Awards encourage chapters to perform specific activities designed to increase professionalism within fundraising and public awareness of the importance of philanthropy. In 2013, AFP International initiated a Ten Star Gold Program. This program recognizes exemplary chapters who go above and beyond reaching the Ten Star Requirements. Chapters applying for Ten Star Gold will complete 10 required goals and 6 additional goals on the same application form in additional to all required key Ten Star Gold objectives. The Friends of Diversity Designation recognizes those AFP chapters who have accomplished many of the key objectives outlined in the advancing diversity strategic goal. This designation encourages chapters to perform specific activities designed to increase diversity within fundraising and public awareness of the importance of philanthropy in all cultures.